Diners will be in for a great feast when two master chef in Cantonese cuisine come together to present A Culinary Feast of Two Cities (双城珍馐食单). 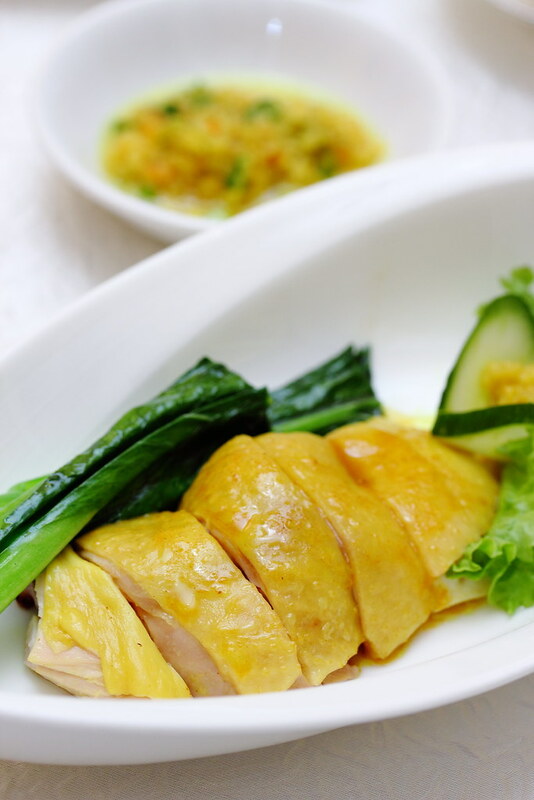 From 02 to 08 November 2015, Executive Chef Lai Ching Shing of One Michelin Star Cantonese restaurant YUE at City Garden Hotel, Hong Kong collaborates with Jade restaurant's Master Chef Leong Chee Yang for the second time, to showcase a number of a la carte and set dinner menus, specially created for this collaboration. We had the Set Dinner Menu B ($98++ per pax) with six courses. The dinner started with the Chilled Fresh Abalone with Chinese Wine, Cherry Tomatoes in Pomelo Vinegar. The abalone was not only tender but flavourful. 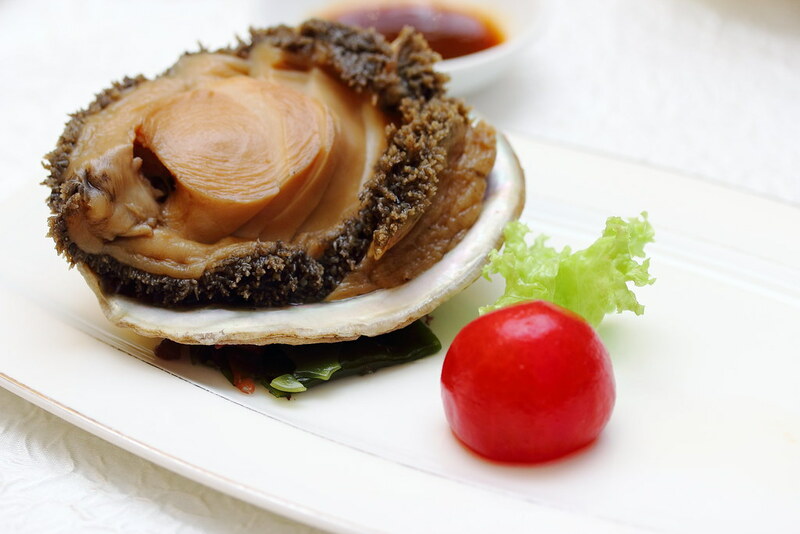 I could taste the beautiful essence that has been absorbed by the huge and plump abalone, bringing life to it. The cherry tomatoes in pomelo vinegar is a nice palate cleanser with its acidity, preparing me for the next dish. 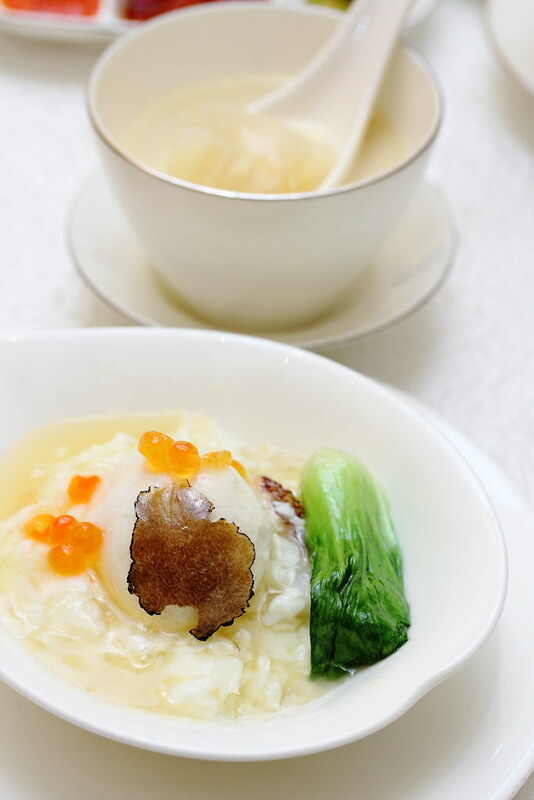 Next dish is the Stir-Fried Sliced Grouper with Truffle Egg White accompanied with Superior Fish Maw Broth. I have tried the classic sai pangxie dish in scrambled egg white form but Chef Lai has brought it to a new level with the fish ball shaped egg white. I am surprised with the play of texture which tasted almost like fish paste. In the other bowl is the Superior Fish Maw Broth that comes with whole piece of thick bouncy fish maw on top of the rich and milky broth. I was looking forward to the next dish which is awarded Gold with Distinction Award at Hong Kong Tourism Board 2015 Best of the Best Culinary Awards. 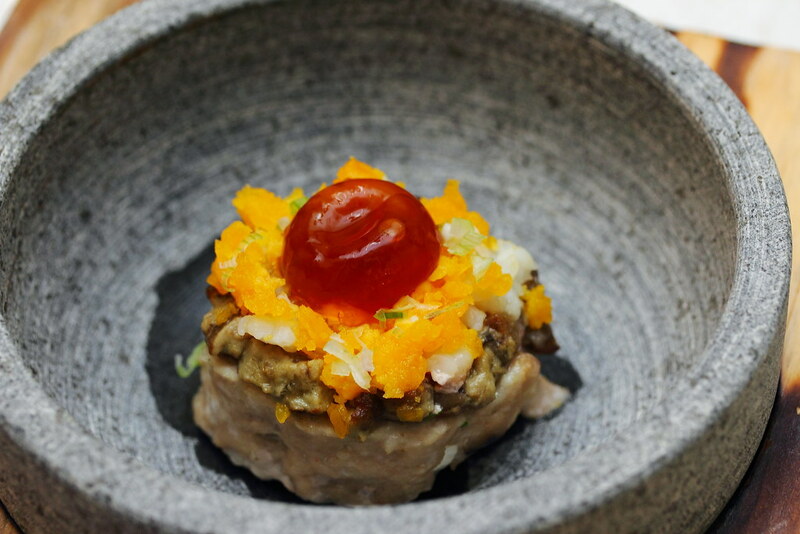 The Steamed Minced Pork with Foie Gras and Scallops served in a hot stone topped with a soy sauce sphere. I am told to cut into the sphere allowing the soy sauce to flow down onto the minced pork. The used of western ingredients and techniques for a harmonious balance in flavour showcases Chef Lai's culinary creativity and skill. 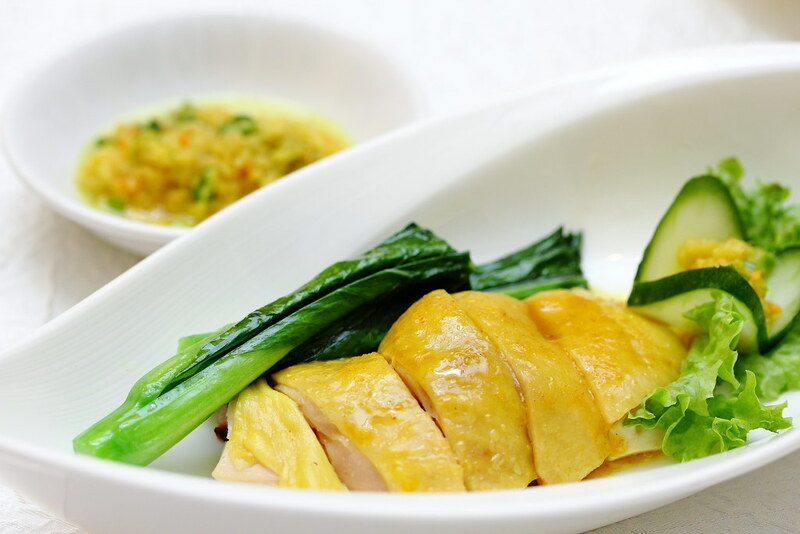 Simplicity at its best is the Poached Spiced Water Kampong Chicken with ginger scallion sauce. The spiced salt water seems to bring out the sweetness of the chicken more. For an extra lift in enjoyment, have it together with the ginger scallion sauce. The Fragrant Fried Rice with Prawns, Barbecued Pork and Diced Vegetables in XO Sauce was the perfect ending to the savoury courses. I could smell the aroma of the fried rice from a distance. 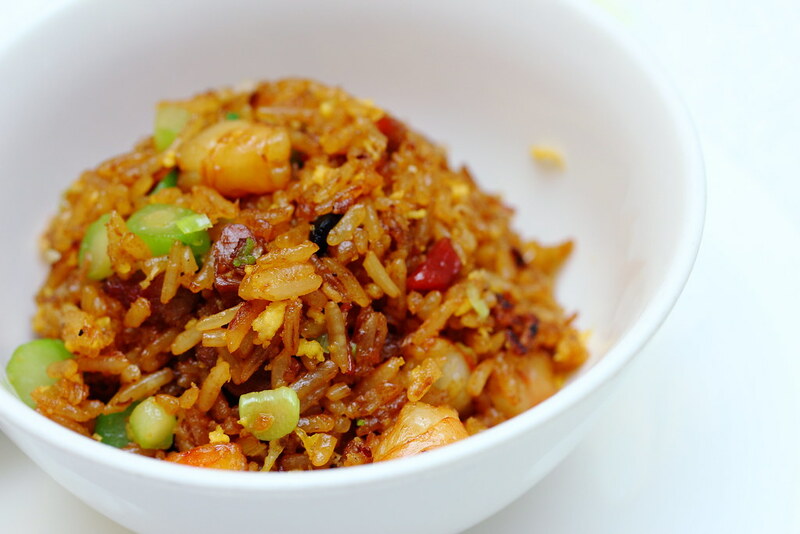 The grainy bite of fried rice well coated with the XO sauce together with the other ingredients was a delicious and comforting finishing. Wrapping up the six course dinner menu is a trio of desserts. 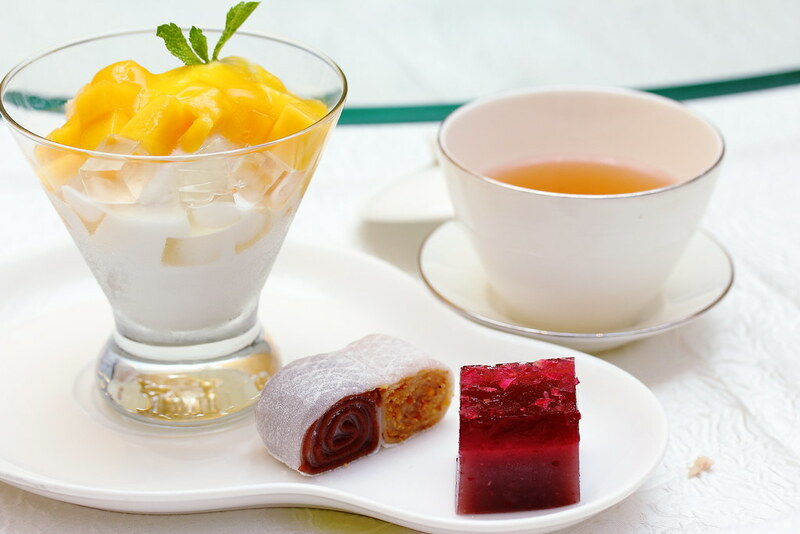 On the plate, there is Shaved Coconut Ice with Mango, Glutinous Rice Roll with Lotus Seed and Peanut Puree and Chilled Roselle Rose Tea Pudding with Red Bean Puree. My favourite was the Shaved Coconut Ice with Mango with its fruity and refreshing finishing, a refreshed take from the common mango sago. Besides the Set Dinner Menu B ($98++ per pax) which I tried. There is another six course Set Dinner Menu A ($118++). together with another seventeen a la carte items on the menu. For a limited period from 02 to 08 November 2015 only, do make your reservation at Jade Restaurant if you do not want to miss trying out the dishes by Michelin-star Chef Lai and the talented Master Chef Leong.